In the film industry at present, where fairy tales are expected to be reinvented with innovative twists or at least challenge the norms of the genre, successfully remaking the classic tale of Cinderella as a straight-up live-action version, is a surprisingly difficult task. In light of some of Disney’s recent triumphs, such as Maleficent (2014) and Frozen (2013), which offer alternatives to the typified Disney princess formula, it is no longer enough to dazzle young girls with sparkling dresses and a happily-ever-after. In fact, we assume these blockbusters to entertain the whole family, and leave the cinema slightly disappointed if we are not offered the winning combination of unlikely heroes, sassy remarks and a comedic talking snowman. With these pioneering remakes as its backdrop, it would be easy for the far more conventional Cinderella to fall flat; yet it is through Kenneth Branagh’s determined simplicity and almost nostalgic tribute to the style of the original animation, combined with the aesthetic of modern fairy tales such as Nanny McPhee (2005) that this film really flourishes. Whilst the artificially-perfect lighting and traditional once-upon-a-time voiceover establish that Branagh’s remake is to follow the conventional fairy tale set-up, it is by no means a carbon copy of the original Disney animation. The various additions and alterations to the storyline, which draw on elements of early versions of the tale, create an intriguing watch, without needing to drastically challenge the viewer’s expectations of the plot. The opening of the film effectively focuses on the deaths of both of Cinderella’s parents, and may even spur a tear or two from those more emotionally inclined. Though many of these opening montages are perhaps a little clichéd, even for Disney, observing Cinderella’s past interactions with her parents allows for a better understanding of what would otherwise seem to be a rather weak and naïve character. Cate Blanchett’s portrayal of the evil stepmother is spectacularly calculated, and her deceitful comportment and chillingly counterfeit smirks win her the strongest performance by far. Though the stepsisters (Sophie McShera and Holliday Grainger) are ugly by nature rather than at face value, their ridiculous bickering and prancing offer the perfect counterpart to Blanchett’s composed and discreet wickedness. A few things stick out as odd at the beginning of the film: whilst it is accepted that Cinderella has an understanding of animals beyond the usual human capacity, she cannot speak to them, which makes the incessant squeaking of her mice friends rather unnecessary, and frankly quite irritating. Furthermore, Rob Brydon’s appearance as a royal painter offers a jarring attempt at a comical undertone in an already odd scene, and his line “I’m literally lying on the floor” falls uncomfortably amongst the archaic structures of language spoken by the majority of characters. That is not to say that comedy doesn’t work in this adaptation; Helena Bonham Carter’s Fairy Godmother adds the much-needed quirky humour, which allows for a smooth transition into the magical world. Finding a way to realistically introduce magic in live-action films can be problematic, but the focus on Bonham Carter’s hysterical incompetence and teasing self-doubt make for a seamless shift. 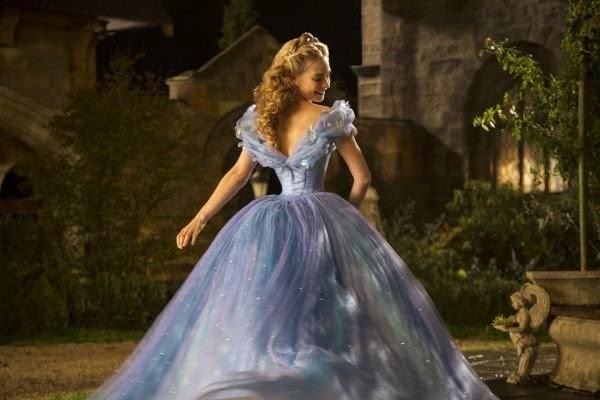 The main plot change from Disney’s original adaptation was the addition of Cinderella and the Prince’s early meeting, whilst out riding in the woods. Rather than Cinderella wanting to attend the ball for the chance to meet a prince, she wishes to go in the hope of seeing Kit, who she believes to be an apprentice working at the palace. In this sense, and with the added focus on the Prince’s relationship with his father, Branagh does challenge the conventions of fairy tales; personality takes precedence over status, beauty and wealth, for both Cinderella and the Prince. In spite of the largely similar plot, the morals of Branagh’s Cinderella differ from the arguably shallow messages of its animated predecessor. One particularly prominent statement came from the narrative voiceover towards the end, in recognising that one of the hardest things to do in life is to present yourself just as you are. Of course the underlying message was still one of kindness, with the words of Cinderella’s mother repeated throughout: Have courage and be kind. Whilst the film lacks the innovation of other remakes and twists on classic fairy tales, this version of Cinderella certainly deviates from the well-known plot enough to develop its own variations of characters and quietly queries some of the messages of conventional fairy stories. One thing is for sure: it has made me excited to see what Disney do with the upcoming Beauty and the Beast remake. However one question still remains – and it’s one that always leaves me confused with Cinderella – if the magic wears off at the last stroke of midnight, why and how does the glass slipper remain? !